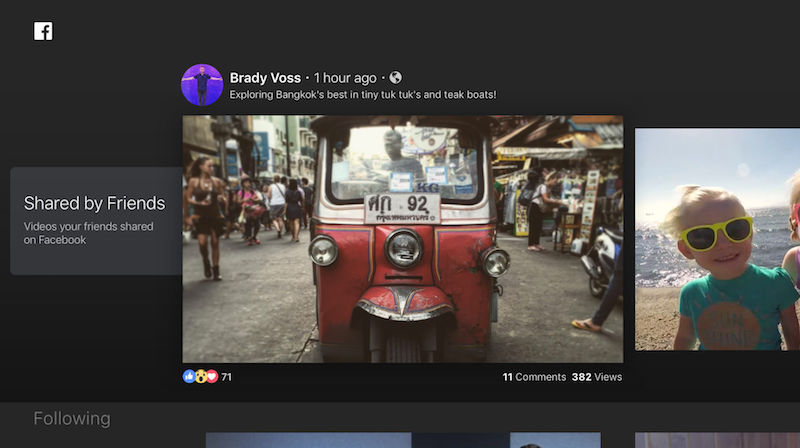 Facebook tonight launched its Facebook Video app for the fourth-generation, tvOS-based Apple TV. The app allows users to watch videos from friends, liked pages, top live videos and more. Videos are split into six channels: Shared by Friends, Following, Recommended for You, Top Live Videos, Saved Videos and Recently Watched. Following contains videos by both friends and liked pages while Shared by Friends only lists videos from friends. The app is more robust than Facebook's fullscreen video mode on the web or iOS, which only lists select recommendations and autoplays the next video in the recommendation queue. Earlier this month, Facebook's VP of Partnerships said the app would not feature ads at launch and will require a Facebook account to use. Facebook is also reportedly in discussions with media companies to license long-form "premium" content to bolster its video selection. The app is not a standalone app. Instead, it's built into Facebook for iOS. Apple TV users will access the video app while iOS users will only be able to access the standard Facebook app. God no more Facebook. Please. The scrolling is backwards! The lack of user interface consistency across various apps needs to be corrected on tvOS. Do you swipe right to go right?...or do you pretend that your are physically moving the object on the screen, and swipe left to go right?? Apple needs to be stricter on these kinds of things because the Apple TV experience is pretty confusing at this point. I guess I'll try it but what do I watch? It's not like there are any quality material available. At least not if it's the same crap that comes up in my feed. And the clips are usually 30 seconds max so it's not like I will fire up the ATV just to finish a clip there instead..
Facebook: dumbing down the internet since 2004. ...will require a Facebook account to use. I am used to it by now. But my wife still messes up tvOS 'scrolling' aka going from one App to the other on the Home Screen. I, too, am not sure whether the current implementation makes a lot of sense... especially for Apple. Agreed. Hard pass on this one.